Effie has taught and assisted with classes for a wide range of ages (3 to Adult) and abilities in varying genres of dance. Her teaching experience began in local dance/ theatre schools – Chaplin Theatre Arts (Alli Coyne), CentreStage Theatre School MK (Peter and Jacqueline Addis) and Big Red Curtain Theatreworks Stage School (Brenda Whitehead). During which time she completed her IDTA Associate Ballet Teaching Qualification. Effie has also taught in an outreach capacity for several of the performance projects that she has been involved in – Shobana Jeyasingh’s Counterpoint and Ffin Dance Tours. Effie's teaching focus is currently on delivering contemporary dance classes and workshops. This has seen her teaching classes in many environments including schools, colleges and universities. One of her most long standing teaching commitments is for The Open Dance Group (OU) in Milton Keynes - a drop-in class which takes place on a Tuesday evening and is open to adult dancers of any ability. Since September 2017, Effie has also lead the contemporary classes for young people at Arts1 School of Performance on Saturday mornings. In 2015, Effie joined the team of animateurs for Rambert, Britain's oldest dance company. 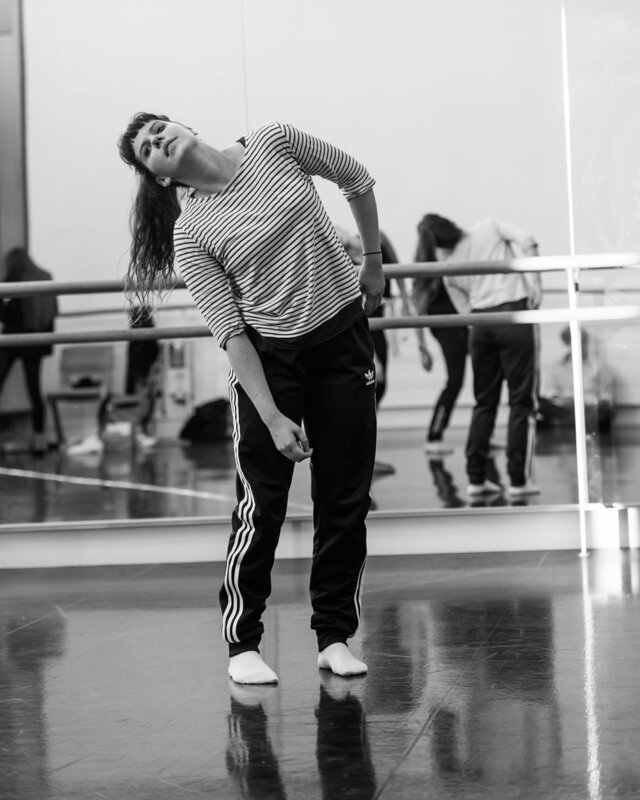 Effie plans and delivers UK wide dance workshops based on Rambert repertoire with an emphasis on learning choreography and creating new work at the heart of the experience. In this role, she has worked with Primary, Secondary and SEN school groups, Degree Level Students, Teachers for CPD days, Older Adults, Families and the general public at large in festival events. In 2017, Effie collaborated closely with the Rambert Archive to deliver contextual workshops celebrating the company's 90th Birthday year. As part of this Rambert at 90 project, Effie devised and delivered a workshop on each decade of the company’s history in order to produce designs for a collection of infographics which are now available to view and download on Rambert’s website. Effie worked for dance-in-education company Dance Equation (Rebecca Hart) from 2011 to 2017. In this capacity, Effie performed in KS1 and KS2 shows and lead workshops incorporating maths themes in a creative way aimed at kinaesthetic learners. Effie is used to delivering workshops within the primary school setting having visited many schools across the country. Through Dance Equation Effie has also been involved with special commissions from secondary schools to devise and incorporate students into performances.